with a Benedictine and Monastic character that is taught at the Istituto Monastico, Sant’Anselmo, Rome. Monastic Studies traces its descent from the early traditions of monastic learning that are ‘sapiential’, rather than ‘scholastic’. Pope Benedict XVI referred to the value of ‘monastic theology’ in a General Audience of 28 October 2009. 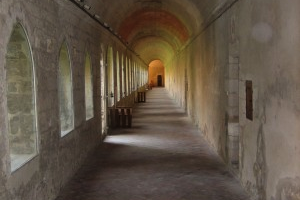 Monastic theology also has its home in medieval Benedictine and Cistercian monastic colleges of Oxford and Cambridge. At Oxford St. John’s, Trinity and Worcester are colleges which descend from such foundations. The monastic colleges aimed to provide the monks of their time with a formation in theology, philosophy or other useful subjects, such as canon law. We would like to make the sapiential tradition available to a wider public than monks and to include great diversity. The monastic core of St Benedict’s Abbey in Ealing is part of its essential character or ‘spirituality’, appreciated by employees, neighbours and tutors alike. While students and tutors of the Benedictine Institute come from all religious traditions and none, living and working alongside monks always proves to be a positive experience for them. In turn, monks can gain from mingling with a very diverse student body, while maintaining the monastic character of their life. It would be great if we could offer a programme adapted to our contemporary European cultures. optional: MS 409 Desert Fathers & Mothers : (offered 2014, 8-11 October 2018) Ephrem Carr O.S.B. optional: MS 410 John Cassian‘s Institutes and Conferences : (offered 2015) Ephrem Carr O.S.B. optional: MS 411 Rules of St Basil for monastics : (offered 2016): Ephrem Carr O.S.B. optional: MS 412 Early Latin Rules: St Augustine of Hippo, Cassiodorus & Caesarius of Arles: 4 days for monastics, 9-12 October 2017: Ephrem Carr O.S.B; 2 days for oblates and lay people, 13-14 October 2017.
optional: MS 421 Rules of St Basil for all: 2 days, 14, 15 October 2016: Ephrem Carr O.S.B.